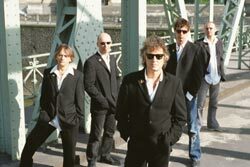 Band members: Wolfgang Niedecken, Klaus "Major" Heuser (until 1999), Alexander "Effendi" Büchel (until 1999), Hans "Fonz" Wollrath (until 1999), "Schmal" Boecker (until 1995), Steve Borg (until 1995), Werner Kopal (from 1996), Jens Streifling (from 1996), Mario Argandona (from 1996), Helmut Krumminga (from 1999), Michael Nass (from 1999), Jürgen Zöller, Werner Kopal. The band BAP is one of the best know German rock bands and was one of the first German bands to reject the idea widely accepted in the 60s and 70s that a band had to sing in English to be successful. They are in fact known not only for their German lyrics, but for composing and singing in the dialect of their native Cologne. Their name comes from co-founder Wolfgang Niedecken's nickname "Bap", which means "father" or "daddy" in their Cologne dialect. The content and style of their music are influenced by musical greats such as Bob Dylan, the Rolling Stones, and the Beatles. BAP experienced their greatest successes in the early 80s singing about common themes derived from daily life. Between 1982 and 1990, 7 of their albums reached number one on the German LP charts. Even in the 90s, 5 of their LPs reached number one or two on the charts. The band went on several tours through Europe, including one through the former Soviet Union in 1989. After their 20th anniversary tour in 1999, three members -- Major, Effendi, and Fonz -- left the band. Major wanted to devote more attention to his career as a producer, composer and solo artist, and Effendi planned to finally finish his degree in mechanical engineering. Major's departure in particular was a great loss; he had been with BAP almost since its inception. Niedecken was determined to keep the band alive, however, and despite the substantial change in band membership over the years, the band still continues to put out albums and go on tour. In 2002, the band released a new live album and DVD called Övverall , and in 2004 they released Sonx , which reached number three on the LP charts. In 2000, a meeting between Niedecken and internationally acclaimed film director Wim Wenders led to discussions about a video collaboration for one of the band's new songs. After Wenders heard the album, he suggested making a full-length film about the band. The road movie Viel passiert, which contains clips and episodes from the band's 25 years in and around Cologne and Germany, appeared in 2003.  BAP is an amazingly prolific and successful band: Since 1982, the group has produced 16 albums, all but one of which have been Top 10 albums and 7 of which made it to #1 on the German album charts.  In 1982, BAP opened two shows for the Rolling Stones in Cologne.  In 1984, BAP played a gig with the Kinks.  The rock band BAP is best known for writing and singing songs in their distinctive Cologne dialect, at a time when dialects were considered appropriate in only folk and traditional music. BAP USA - [English] BAP fan page, updated infrequently.